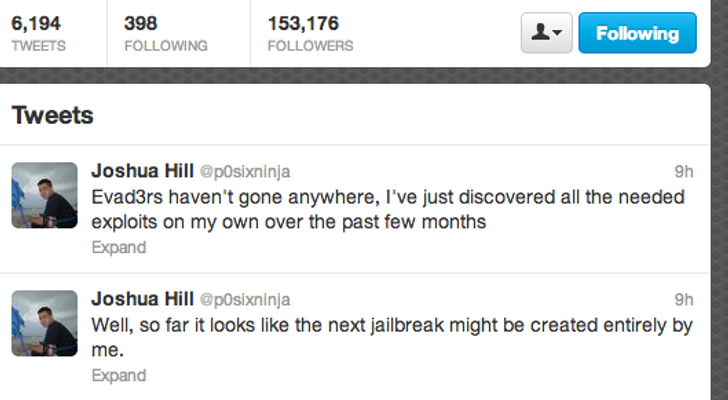 Great news from Joshua Hill today, the internationally-known iOS jailbreaker has issued a couple of tweets informing the masses that we’re in for a new jailbreak. And we’re pretty sure he’s referring to iOS 7. “Well, so far it looks like the next jailbreak might be created entirely by me,” Joshua Hill (@p0sixninja) boasted on Twitter. “Evad3rs haven't gone anywhere, I've just discovered all the needed exploits on my own over the past few months,” he added in a subsequent message sent out to his 153K followers. Mr. Hill doesn’t specifically mention iOS 7, but he’s obviously referring to Apple’s next major iOS release. While Apple has closed the evasi0n jailbreak exploits in iOS 6.1.3, it makes no sense for Hill to burn his precious new bugs for a jailbreak that almost nobody needs at the moment. iOS 7, on the other hand, will be a totally different matter. Considering that some security researchers are more inclined to sell these exploits for hard cash (rather than publicly release them as a jailbreak), Joshua might be in for quite some hype in the coming months.